Spring is finally here… the weather is getting warmer, and strawberries are almost ripe for picking. Mid to late April is usually the start of strawberry season for our area, but some fields in eastern North Carolina are still several weeks away from being ready. In addition to a late start, news that virus infected plants may cause a drop in the number of local strawberries has some worried. We spoke with strawberry growers across eastern North Carolina this week to get an idea on the success of this year’s crop. David Rowe is the owner of Sweet Carolina Farms in Pender County. This year, they’re growing 10 acres of strawberries. Rowe says they’ve picked a few berries this season, but the bulk of the crop will be ready in about three weeks. For the past couple years, strawberry harvesting started early in eastern North Carolina. But cold snaps in late March have delayed the season this year. North Carolina is the third largest strawberry producing state in the country. In fact, the small town of Wallace in Duplin County became known as world's largest strawberry exchange in the 1930’s. Even the local AM radio station had the call letters WLSE for world's largest strawberry exchange. To this day, strawberries remain a popular crop. Executive Secretary of the North Carolina Strawberry Association Debbie Wechsler estimates there are about 250 strawberry growers in our state. According to the US Department of Agriculture, strawberries generate approximately 30 million dollars annually for North Carolina. The red fruit grows easily in the eastern part of the state because of the mild climate and sandy soil. But for Pender County strawberry grower David Rowe, the seasonal crop is becoming less profitable and more challenging to grow every year. Strawberries on 903 is a business owned by Mike Skinner. He says planting strawberries is a huge investment and risk. Skinner grows only three acres of strawberries on his farm in Pitt County. He says this year’s crop looks promising, even though it’s coming a little later in the season. Three varieties of strawberries grow well in this state: Chandler, Camarosa, and Sweet Charlie. The traditional berry grown by most farmers is Chandler. “that one does very well here. That’s probably the major one in our region. The one that has come in more recently and is very popular is called Camarosa. It’s a very large berry, a little bit firmer than chandler and has the advantage that it lasts longer after it’s been picked. The sweet Charlie strawberry has a bright red color and it’s known best for bearing the first strawberries of the season. White’s Farm, located in Craven County is growing over 3 acres of Sweet Charlie strawberries this year. Owner Butch White says they’ve already started picking some of the berries but most won’t be ready for at least another two weeks. In addition to a shortened season, White is facing another obstacle in producing the crop this season. When he planted in October, he purchased his strawberry plants from a nursery in Nova Scotia. Those plantings were found to have a virus that stunts growth and drastically decreases the yield of fruit. It was when White contacted the nursery in Canada that he realized he ended up with virus-infected plants. White estimates they will lose about 50 percent of their profit from this year’s strawberry harvest. According to Strawberry expert Barclay Poling with North Carolina State University, those plant’s berries are safe to eat, but the drawback is not as much fruit is produced. This year, White will sell what strawberries he can and hope to recoup some of the loss from selling tomatoes, cucumbers, bell peppers and other crops grown at the farm. White has not heard yet if the nursery is going to provide a refund for the infected plants. Poling says about 12 percent of the state’s 1,600 acres in strawberry production are affected by the virus-infected plants. Sonny Cottle is the farm manager with Cottle Farms in Faison. They’ve been growing strawberries for 40 years. Cottle Farms grows 60 acres of strawberries for distribution at local grocery stores and roadside stands. Since they grow their own plants, their strawberry plants weren’t infected by the virus. Another way growers ensure locally grown strawberries stay in eastern North Carolina is by offering u-pick fields where people can pick your own strawberries. William Shawn Harding is the owner of Southside Farms in Beaufort County. If you decide to pick your own strawberries, Wechsler says the phrase “redder is better” is one to keep in mind. 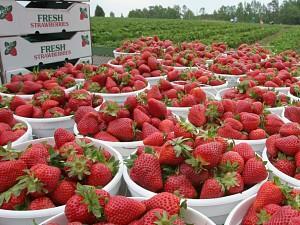 More North Carolina growers are making their strawberries available to supermarkets. But before you put those strawberries in your basket, Wechsler says to check the label. Whether you buy them from the store, or pick them from the field yourself, there are many ways to enjoy a strawberry. Another way to celebrate the red fruit is at one of North Carolina’s many strawberry festivals. The NC Strawberry Festival in Chadbourne NC will be held May 4th. The Carolina Strawberry Festival is going on May 10th and 11th in downtown Wallace. They’ll be another Strawberry Festival on April 27th in Clayton. There are a variety of ways to eat your strawberries. How about a strawberry lemonade cheesecake bar? Or perhaps strawberry tiramisu? You can find these North Carolina recipes and a lot of other ideas at our website, publicradioeast.org.